This hymn is one of Isaac Watts's best known texts, and was first published in Watts's Hymns and Spiritual Songs as “Godly Sorrow arising from the Sufferings of Christ” in 1707. Ralph Hudson added a refrain in the nineteenth century, and this version is often listed under the title “At the Cross,” after the first line of the refrain. Of the six original stanzas, the second (which begins “Thy body slain, sweet Jesus, thine”) is usually omitted. Of the five stanzas in common use, the fourth (beginning “Thus might I hide my blushing face”) is the most frequently omitted. The first, second, and third are always sung, and the fifth is frequently sung. 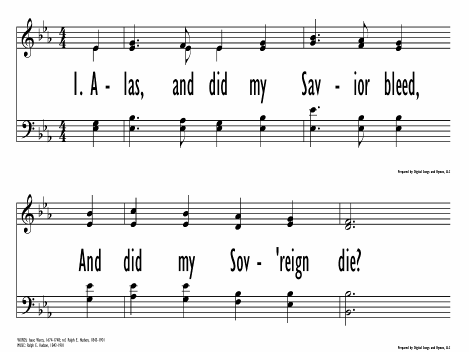 In the third stanza, Watts originally wrote “When God, the mighty Maker, died / For man, the creature's sin.” ( The Psalms and Hymns of Isaac Watts , #II.9) “God” is often changed to “Christ” to avoid literally stating that God is dead (Carlton R. Young, Companion to the United Methodist Hymnal , p. 188). In the next line, “man” is not gender-inclusive, so the line is often rendered “for his own creature's sin.” While this does solve the problem of inclusivity, it somewhat weakens the contrast between God and humanity in Watts's powerful metaphor. There are two common tunes – MARTYRDOM (also called AVON) and HUDSON. It is fairly common for a hymnal to contain both versions of the song. The setting to HUDSON is often titled “At the Cross,” after the first line of the refrain, though sometimes both settings are given the title of the first line of the hymn. The tune MARTYRDOM was originally a Scottish folk tune. The title may come from a Scottish village, Fenwick, which is also the last name of a Scottish Covenantor martyr, James Fenwick. Hugh Wilson, who first adapted the folk tune as a duple-meter hymn, lived in Fenwick. However, the version of the tune that is usually sung is in triple meter, by Robert Smith, a Presbyterian music minister who worked in Edinburgh. HUDSON is named after its composer, Ralph E. Hudson. It was first published in 1885 in Hudson's Songs of Peace, Love and Joy. William J. Reynolds has argued that the text and tune of the refrain were part of the camp meeting tradition, and were merely added on by Hudson. He cites two instances printed in 1887, after HUDSON was first published, where the refrain appeared separately and was not attributed to Hudson ( Companion to the Baptist Hymnal , p. 28-29). Though the absence of an example published before 1885 somewhat weakens this argument, the contrasting musical character of the stanza and refrain melodies, and the differing themes of Watts's stanzas and the refrain text support the idea of separate composition. 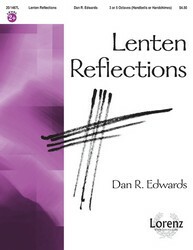 This hymn is usually sung during Lent and Holy Week. Because of the refrain text, “At the Cross” is also associated with the theme of personal redemption. 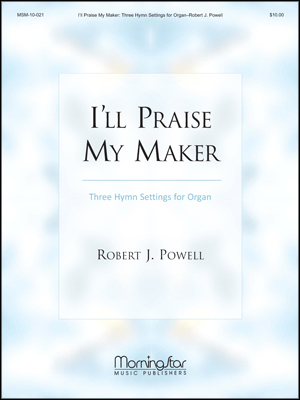 The two contrasting tunes associated with this text present a wide range of possibility for using this hymn in worship. In addition to MARTYRDOM and HUDSON, there is a contemporary setting of Watts's text with an original refrain by Bob Kauflin. Victor Johnson has also written a choral setting of this text to original music titled "Love Beyond Degree". Billy Madison has set "At the Cross" for violin and piano, trading the melody between the two instruments. 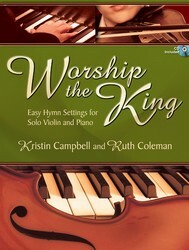 This arrangement is also available for other solo instruments, including flute and trumpet. Anna Laura Page's piano arrangement of MARTYRDOM is part of her collection "Tell the Story". "Beneath the Cross of Jesus," "At the Cross," and "When I Survey the Wondrous Cross" are the three hymns in the orchestral medley "The Cross" by Lloyd Larson and Brant Adams. Display Title: Alas! and did my Savior bleed? First Line: Alas! and did my Savior bleed? 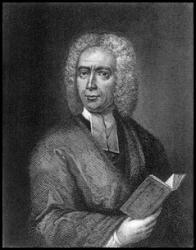 Tune Title: MARTYRDOM (AVON) Author: Isaac Watts Date: 1992 Source: Hymns and Spiritual Songs Book II, 1707, alt.